This tomato really is the best of both worlds! 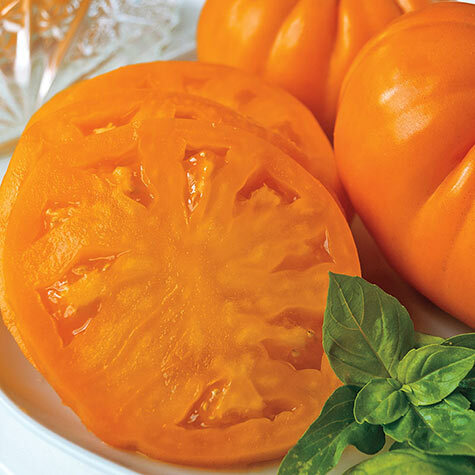 These vibrant orange, beefsteak tomatoes produce a bountiful crop of fruits that can weigh up to 1 1/2 lbs. 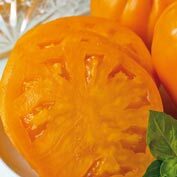 Great for fresh eating, use these orange beauties to add color to salads, salsas, sauces and more. Indeterminate. Disease resistance: VF. 74 DAYS. For each offer ordered, get approx 15 seeds per offer Pkt. Botanical Name: Lycoperiscon lycopersicum "Orange Whopper"
Height: 6 - 8 feet. 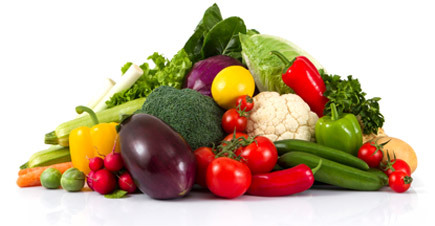 Indeterminate (will grow and produce fruit until frost. These plants should be supported by stakes or tomato cages). Depth: Plant outdoors after any chance of frost is past. When transplanting, set the plant deep, up to the first true leaves, by digging a deep hole or trench. The stem will develop roots along it's length. 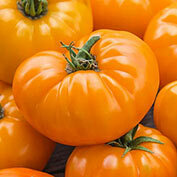 Fruit: Large tangerine colored, beefsteak-type tomatoes up to 1 1/2 lbs. Comments: Heirloom flavor, hybrid productivity.